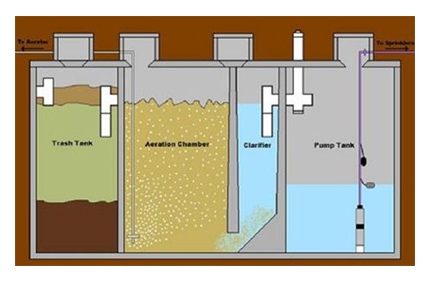 The aerobic wastewater treatment system has been designed to operate with a minimum of service on the part of the owner. However, as with any major appliance, there is a certain amount of care that should be taken in order to ensure a long, trouble-free life. The aerobic system is a sewage treatment plant, which works the same as municipal plants serving large communities. The system uses aerobic digestion to process most of the waste materials. The treated and clarified effluent is more than 95% free of all waste materials. Laundry: Please do not have a "wash day" and run several loads of laundry through the system at one time. Spread your loads throughout the week. Detergents: The normal amount of detergent foam from automatic dishwashers or clothes washers will not normally affect the aerobic plant. Excessive use of any detergent (especially a high foaming, high phosphorous and non-biodegradable detergent) is not recommended as it will have a detrimental effect on the treatment process. Any high concentration of household cleaning chemicals should not be discharged into the treatment plant. Garbage Disposal: Excessive use of a garbage disposal may increase maintenance cost due to build-up of solids in your treatment system. Only food wastes should be placed into the garbage disposal. Fibrous Material: Such material as diapers, excessive hair, bandages, sanitary napkins, tampons, rags, string, latex, or plastic must never be disposed of through the system. Nothing but sewage should go into the unit: IF YOU CAN'T EAT IT OR HASN'T BEEN EATEN - DON'T PUT IT THROUGH THE SYSTEM.